Whether you’re preparing for a move, or just need to get organized, now is the perfect time to put these spring cleaning tips for the office into action. Spring cleaning helps you document, plan and manage your inventory. It also makes it easier to pack your contents and manage workflow during an office move. With that in mind, here are 5 spring cleaning tips for the office to make moving easier. Before you start clearing out your office, you need to have an objective. Are you preparing to move to a new office? If so, your primary objective may be to decommission your space. That means disassembling furniture and removing everything from your office, cleaning floors, washing walls, and making minor repairs. It’s best to hire office decommissioning professionals for this degree of work. They’ll get the job done safely and efficiently. You’ll also need to determine what to bring to your new office and what to put into storage. It’s a good idea to give everyone who’s moving a clear understanding of the new space, so they can contribute to those decisions. Are you moving employees within your current office to improve productivity? Use spring cleaning as an opportunity to assess what’s essential for a high-functioning, well organized office. Which furniture and filing systems make daily tasks more efficient? What needs to be replaced or recycled? Do you need to ready space for new hires? Maybe you’re moving a team to another location and reconfiguring the space they used to occupy. Why you’re cleaning will help determine what you want to accomplish. From there, you can clean, clear and reorganize, to enhance both individual and overall company performance. Many office managers focus on cleaning out desks, filing cabinets, even entire offices, without looking at the bigger picture. What’s coming up in the next quarter? Next year? Will you be transitioning more employees? What are your conference and meeting room needs at this facility? Answering these questions about the future of your office can help you decide how to make your existing furnishings work for you. And whether or not you’ll need short or long term storage. This way you won’t panic when it’s time to reorganize or move. If you don’t consider the bigger picture, your team will struggle to work through the transition, and adjust to their new surroundings. I hate it when there’s nothing on people’s desks. That concerns me. Aligning your spring clean with your company culture sets clear expectations. And it makes it easy for people to maintain those standards, because it’s reflected in the atmosphere around them. 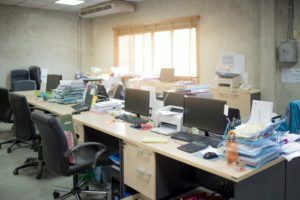 Once you’re clear on what’s in store for your office in the near future, and you’ve established spring cleaning standards that reflect your office culture, you’ll likely find gaps in your current execution. For example, you may discover that you need to update your office layout more often to provide a creative boost to your team. Dust, mildew and poor air quality may prove to be recurring issues that require a more permanent solution. Or you may have unrealistic workflow expectations given your current setup. Have you identified outdated decor or worn furniture that needs replacing? You may need to invest in new office furniture or a design plan, or you may be able to rework the space with your existing furniture. Decide which gaps you’d like to focus on filling. You may even want to make this a shared document so staff can add requests, or comment on new layout arrangements. Companies move things around more often than you might realize. If you’re not, you probably need to. By keeping your office clean and organized, change is easier to identify and faster to execute. A good spring clean makes your office a healthier, happier place to work. Keeping your office clean and organized helps reduce the stress of reorganizing and moving. The more you stay on top of it, the easier each transition will be. And your physical office will easily keep pace with your business objectives, helping you reach your goals. Email us for help. We’re experts in office decommissioning and moving, ready to spring into action.